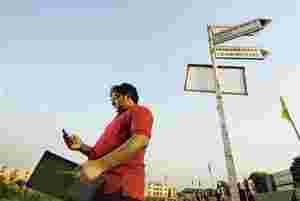 New Delhi: On a warm day, in the deserted Knowledge Park in Greater Noida, Sanyam Jain stands at an intersection with a clipboard in one hand and a mobile phone in the other. He looks intently at his surroundings—a bus stop, a food kiosk, a photocopy shop—and makes quick notes. Then, looking at his phone, he sets off at a purposeful pace down the road, looking like a prosperous surveyor with a lot of surveying on his mind. “Everything in Greater Noida is far away from everything else —even simple things like photocopy shops," he says. “People need to know where they are." Later that night, after his wife is asleep, Jain will log on to Google Map Maker and mark the photocopy shop—as well as the bus stop, the kiosk, and the names of half-a-dozen colleges—on the Google Map of Greater Noida. And he’ll add more the next day and the next, just for the satisfaction of seeing his township swell in detail online. From being simply a practical tool to find the nearest Chinese restaurant, the launch of Map Maker two months ago spawned an excuse for many people to go offline—to set off on mapping sorties, as Jain does, and to help refine the maps of Indian cities and towns in their own time. There’s no underestimating the power of local knowledge, Jain points out, sounding a little like a bank motto. “A satellite picture would never have been able to capture areas like Chandni Chowk in New Delhi" —areas, he explains, that consist of tiny, labyrinthine alleys invisible from space. “Or even that kiosk, for instance." Google had fully intended to rely on this local knowledge, as Mint reported at the time of Map Maker’s launch in late August. In that sense, it resembles Wikimapia, a similar collaborative mapping tool that was launched in mid-2006 and is now a cartographic directory of more than seven million locations across the world. When much of Google Maps still consisted of basic satellite photos, Google began releasing Map Maker in instalments. “First we asked our employees to build the areas they knew, then phased it to the friends and families of employees," says Lalitesh Katragadda, the creator of Google Map Maker. Google Maps works as a simplified graphic overlay to satellite pictures; a road on the satellite image will show up as a road on Maps only after it has been traced and labelled. Map Maker opens that activity up to everyone, relying on the crowd sourcing for breadth and accuracy much as Wikipedia does. In Bangalore, Rakesh Goel, a project manager at Wipro Technologies by day, became a map maker by night after GPS (Global Positioning System) led him down dead-end and non-existent roads during a drive to Ooty. “The Google Map of Bangalore is better than most others, but it still isn’t fully accurate," Goel says. “For instance, on my route to work, the map shows a regular road where there is in fact a side-ramp near a flyover." Goel works particularly hard on maps of villages and other remote areas, and he’s planning full-fledged mapping vacations to Ooty and Goa. “Even if I map the areas I pass through, that will be useful," he says. At work, he’s online almost all day, and Google Map Maker serves as a brief refuge. “When I need a break or a distraction, I log on and map a little." Jain, a 26-year-old graphic designer and the head of his own design shop, was first drawn to Map Maker because of Sim City, a cherished video game that involves creating functional cities from nothing. “Somehow, this activity reminds me of Sim City," he says. But Jain also harks back to driving holidays with his father, when he was much younger. “We’d go to a country, say Switzerland, and he would want to drive everywhere," he says. “So we’d rent a car, and I’d be assigned the role of navigator." From all that poring over maps came his current obsession. Appropriately enough, Jain has a fabulous sense of direction. In the middle of the Knowledge Park, talking voluminously and earnestly about the Greater Noida area, he whips out bearings with the effortlessness of a conjurer pulling silk scarves from his sleeve. “That way lies Dadri. And over there is the Hindon River, which I was the first to label. And that way was an overland drainage pipe, which I followed and traced out on the map." When he first started work on the maps of Greater Noida, Jain faced a veritable tabula rasa. “The satellite photos of the area were all in place, but the maps were really blank," he says. “I had to start with tracing roads, marking out water bodies, that kind of basic thing." Greater Noida posed a unique set of challenges. “For one thing, everything here looks the same," Jain says, with a grin. “The road systems are more complex. The medians are wide, so you need arrows to indicate traffic direction. Then there are the service lanes and the bus lanes—all those need to be traced individually." Within the larger Indian context lies a proportionately larger challenge. Since the number of people with ample Internet time to spare is so much smaller than in the US or Europe, and since they are concentrated in tight urban singularities, many areas run the risk of just never being mapped. Unless, that is, they happen to catch the eyes of people such as Jain. Jain has bustled actively about this calling. He has visited the local Honda Siel and the erstwhile Daewoo plants to map them; he labelled the helipad, the under construction hotel and the driving range at the Jaypee Greens Golf Club; he has marked hospitals and petrol pumps and police stations; he slips into residential colonies; he wants to next visit and map Atta Market, Noida’s version of Old Delhi’s Chandni Chowk. On these expeditions, Jain carries printouts of the satellite photos, and with his GPS-enabled Nokia E71, he flicks rapidly through the extant maps to spot gaps that need filling in. “Even when I go for a haircut, I carry Post-It notes, to write down the names of businesses in the area, so that I can fill them in when I get home," he says. Jain has done enough good work on Map Maker to be awarded the status of “moderator", with powers to approve, or turn down changes by others. But even his additions are sometimes rejected by other moderators. On his phone, he pulls up an email from a moderator named Anu, who questioned his inclusion of high-tension power lines. The incentive, for ardent mappers such as Jain, is twofold, Katragadda feels. “I went out and mapped the Indian Institute of Technology in Bombay, which is essentially my hometown," he says. “It’s emotionally very satisfying to see the place where you grew up incarnate itself on a map. It feels tactile, it feels real." But also, Katragadda adds, many people are just too fed up at the lack of a reliable map. “Given that, it’s very useful for me and my friends to add the 10 things we know," he says. “It isn’t a selfish motive. Because when they take time out to add these things that they know, they’re really just being good Samaritans."